I already had a blog post planned for today. I was going to write an open letter to David Stern, the commissioner of the National Basketball League (NBA) in which I was going to publicly criticize him for allowing the NBA to only give Ron Artest (er, sorry Metta World Peace) a slap on the wrist with a seven game suspension. Artest blatantly elbowed James Harden on the back of his head after Artest's slam dunk the other night. It was a vicious blow to Harden's head that left him with a concussion. With Artest's history as a trouble maker Stern should have banned him from the league. My open letter to the Commissioner was going to ask him how I'm supposed to let my children watch NBA games if this is the type of behavior they will see. I don't need Ron Artest to be a role model for my children; they have enough positive role models in their lives already. However, I cannot in good conscience allow my children to watch a professional basketball game (or even the highlights on ESPN) if such cheap shots are going to become commonplace in the NBA without serious repercussions. And then I saw the news today. 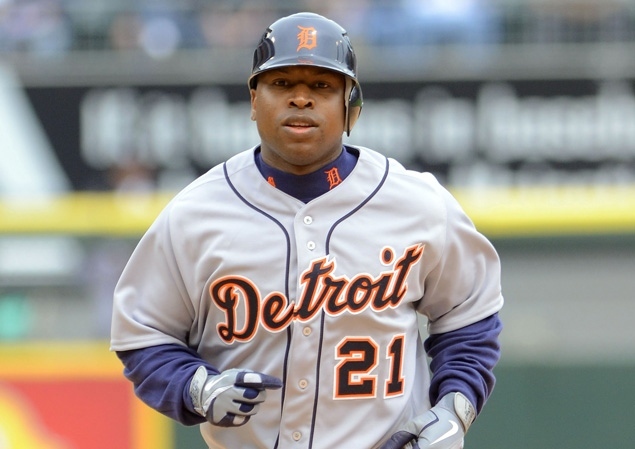 Detroit Tigers outfielder Delmon Young was arrested outside of the hotel where the team was staying in New York City. Young was "highly intoxicated" according to a police source and he was arrested after allegedly shoving a man to the ground and making anti-Semitic remarks. The Detroit Free Press reports that Young faces an "aggravated harassment hate crime charge" for the anti-Semitic remarks he made during the incident. When I read the news about Young, my heart sank to the floor. My oldest son is 8. In the past year he has become a die hard Detroit Tigers fan. He knows all the players by name. He knows their uniform number and their statistics (just like I did when I was a Tigers fan at that age). How am I supposed to explain to my son that Delmon Young was drunk, got into a street fight, yelled an anti-Semitic slur and got arrested? To my son, Delmon Young is a hero. He cheers for him. He prays that Young will hit a home run when he comes up to bat. I don't think that it ever occurred to my son (or to me for that matter) that Delmon Young hates Jews in an inebriated, full-of-rage Mel Gibson sort of way. Thanks to the Detroit Tigers organization and specifically owner Mike Illitch and Dave Dombrowski, the teams President/CEO/General Manager, baseball has become exciting again here in Detroit. The team has really made a concerted effort to reach out to children. That is great, but it also means that the organization has a responsibility to handle this matter quickly and appropriately. Delmon Young needs to be treated for his alcohol problem and a response to Tigers fans must be made soon concerning his anti-Semitic slur. For me, I still don't know how I will explain this to my son or if I will at all. The bottom line is that no one is asking professional athletes to raise our children. They are great athletes and not always shining examples of virtuous human beings. However, they need to know that children are watching. Impressionable children are watching how athletes behave on the field or on the court, as well as outside of their hotels. The NBA and Major League Baseball are both doing great things to help their athletes give back to the community and be good citizens. But they have to take care of the bad apples as well. I don't know what the appropriate punishment for Delmon Young should be, either within the Tigers organization or in Major League Baseball, but I know that a strong message has to be sent to the young fans so they know this behavior is not tolerated. well written, Jason. I agree with most of it, in that MWP should have been suspended for much longer, given his past incidents. I also hope that the Tigers come down hard on Young, because that type of behavior is unacceptable for their club, as it should be for an employee at any company. Especially one as high profile as an MLB franchise. That said, I have to take issue with a couple points you made. 1) I'm not sure the assumption that Young has a "drinking problem" is accurate. There no (that I know of) history of him in other alcohol-related incidents. There are countless people who have done stupid things and made mistakes while intoxicated, whether it's their first time drinking, or they are alcholics. Hard to say if he needs treatment of any kind for that. He definitely needs to address how he handles conflict, and treats people of different races/cultures, etc. The other point I'd debate is whether or not we can expect all pro athletes to curb their behavior off the field. On the field, I think it's fair to expect that, although it will never be across the board, 100%. Off the field though, these are young men with lots of money. I'm not condoning bad behavior at all, just saying it's too much to expect there to be no bad apples. It's a microcosm of society, and no matter how much we think that being in the public eye and being paid millions of dollars means being an angel, it's just not reality. Again, I liked your blog post, well said. And I hope the Tigers take a harsh stance on this type of behavior, to set an example. I wonder if Mr. Young would like if someone called him a n*****? I think not, but I doubt he could rationalize it if someone sat down and explained it to him. The problem with people like Mr. Young is they complain that they have been persecuted, but they are quick to jump up and put down those who are physically weaker than themselves. I'm trying to think of an athlete that got into that kind of trouble when we were kids. I realize Delmon Young may have been drunk. And if he was drunk there are no limits to how much you can drink. There are laws about public intoxication. If Delmon hadn't have been drunk i'm sure he would not have said these slurs. What you should be writing about is what ever the cause of the altercation this should be a FREEDOM OF SPEECH ISSUE. After all we a PRESIDENT that wants us all to hate each other for one reason or another, to keep us divided and constantly promotes his own brand of race envy. Just found out about this incident. Very disapointting. Your veiwpoint is very well written. The thing that popped in my head while reading your post is a quote Tigers announcer Rod Allen often uses. "A bunch of grown men playing a kids game" (or something like that). It's such a true statement, and children become very attached to professional athletes as a result. Even off the field, they are still on high pillars in the eyes of the fans, the young ones especially. They get the privilege of playing baseball for a living. How awesome is that. It's what many of us dreamed about as children, and what very few are able to achieve. The public intoxication I can accept. Being in New York is exciting, things can get a little out of control, I can understand that. Yet, the anti-Semetic slurs is disgusting. No place for it in any professional sports. I've always though baseball, above all sports, has been a great melting pot, on the field, and in the stands. Is their any other sport where so many races compete together (minus Olympic competition)? That is one of the great beauties of baseball. That being said I sympathize with your situation. While many like to use baseball as an escape from all the negative things going on in their world or life, sometimes those negative things find their way into baseball. Its sad, it really is. Especially when it comes down to having to explain something as ugly as racism to a child. I do hope the Tigers organization takes serious actions. Detroit has been home to many races over the last century as a result of the golden days of the auto industry. I've always viewed the city as wonderfully multicultural as a result. That old English D is a representation of that. I don't care how great an athlete is, how many home runs they hit, bases they steal, or strikeouts they throw, there is no room for racism of any kind in baseball, and in all sports. Your post is well written, Rabbi Jason, and very heartfelt, but I believe there is much more to be made of this teachable moment, for your son and for the public debate around it. Apparently the target of Mr. Young's alleged slur was a panhandler wearing a yarmulke and a Jewish star. While the slur allegedly uttered was directed toward the person's religious affiliation, Mr. Young's apparent sense of impunity to do so in the first place seems to a function of money and power. Most estimates place Mr. Young's 2012 salary above $6 million. One has to wonder if, as in so many cases in contemporary society, wealth and status has created a specter of entitlement to say and do whatever one wants, especially to others perceived as being "lesser" people simply because of their station in life. Slurs based on race, religion and ethnicity are still an odious part of society today and must be condemned at every opportunity; Mr. Young's apparent state of intoxication should provide no cover for his alleged actions. However, it would be a shame if this incident did not also highlight another deplorable phenomenon of those who feel that money and celebrity gives them a right to say and do whatever they like to some of the most vulnerable and often forgotten members of society: the poor and homeless. How can the Tigers expect to break out of a slump and win a championship when a teammate is getting drunk the night before a game, shouting hateful remarks to strangers, and getting himself arrested on aggravated harassment hate crime charges? What a jerk! I think Ilitch should just fire Young. You don't need this BS when you're trying to win a championship. He is a disgrace to people of Detroit and the Tigers organization. There is no way you can win on or off the field with this kind of mentality. Delmon Young deserves another chance. Let him rehabilitate himself somewhere else. You may want to WAIT FOR THE FACTS before you judge a person. Shame on you. How do you know he said anything at all? Maybe you haven't been drunk or been in a situation where there are intoxicated and excited people, but things are said, accusations can be made, and anything is possible. Mr. Young made a poor decision to be in the situation, and he's apologized. But we DO NOT KNOW if he said anythign anti-Semitic, and for you, as a supposed "leader" in the Jewish community to assume he did and to express outrage and dismay at his actions is irresponsible, in my opinion. How would you like to be judged based on partial facts? if it turns out that Mr, Young did not make anti-Semitic remarks, will you apologize? Mark: In recent years, Ozzie Guillen, Roger McDowell and John Rocker. When we were kids there was always Cincinnati Reds owner Marge Schott. Also Gary Sheffield made some racist comments about Latino players. Sports heroes are galvanizing in the media, yet we forget that they are flawed as humans like all of us. I am not in favor of erecting statues of sports icons left and right. That's your opinion in regards to the President. Only a person who is guilty of those things would accuse someone with little proof of it.